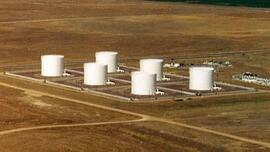 Denver International Airport chooses XR-5 geomembrane to protect subsoil and groundwater from jet fuel containment. When Dallas/Fort Worth International Airport opened in the early 1970's, it was termed the airport of the future. That future is now, and the new Denver International Airport is being termed the Airport of the 21st century. Denver International covers an area roughly half the size of the city of Denver and uses concourses as long as 0.6 mile. The $2.7 billion, 53-square-mile airport represents state-of-the-art technology for environmentally conscious air transportation management.